I definitely enjoy cooking with oatmeal. I already used it to make pancakes and veggie burgers, so I decided to make a muffin next! It's cheap, it's easy, and it's healthy. What's not to love? These muffins are tender, sweet (but not too sweet), and are packed with amazing flavors like cinnamon, nutmeg, and vanilla. They make a very portable breakfast or snack too! Ground chia seeds act as the binder in this recipe. To grind the seeds, simply place them in a coffee grinder (one dedicated for spices and seeds would be best) and blend until you basically have a flour. Hydrate them in warm water and allow to sit for five minutes. The other night I was craving Mexican-y food, but I absolutely did not want black beans. 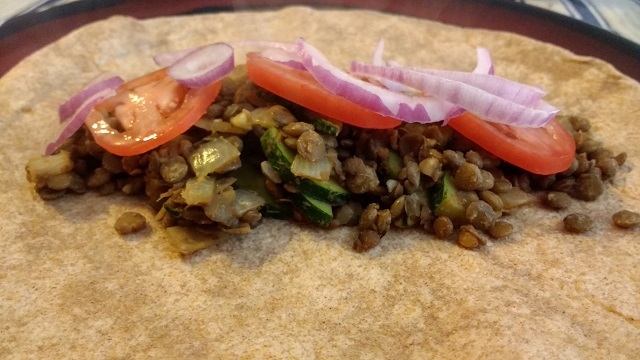 I decided to use lentils as the protein, sauteed up with some onions and zucchini. It was amazing! In frying pan, you simply saute up all the ingredients, then simply layer into your burrito and enjoy. It's really easy to make. If you make the lentils ahead of time, this would make a really nice meal to make in a short amount of time. I topped my burrito with fresh tomatoes and red onions. You could finish yours off with whatever you happen to have on hand: salsa, guacamole, scallions, fresh cucumbers, etc. My 2 year old is (quite unsurprisingly) fond of pancakes. The problem, is that pancakes tend to be full of processed wheat, refined sugar, and not much else. 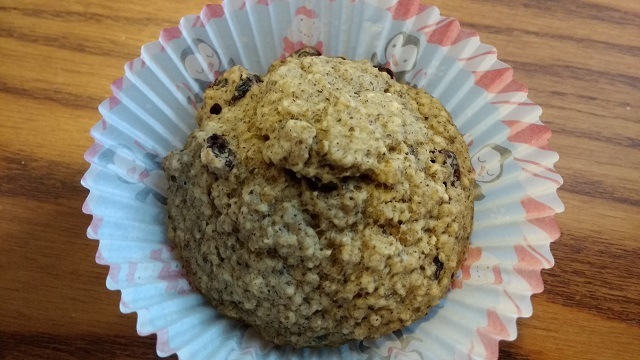 I decided that I wanted to give these a nutritional twist; with whole grains from the oatmeal, fresh veggies from the carrot, and unsweetened raisins. It only contains a tiny bit of coconut sugar for sweetness, and even that you could probably omit. These pancakes contain absolutely no flour (except for the oat flour that you make yourself from oatmeal). 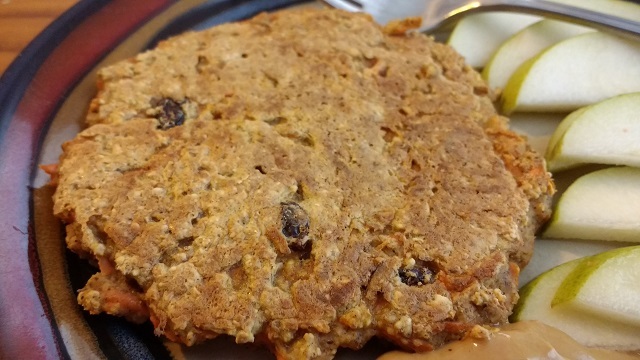 If you choose to use gluten free oats, you could make this recipe completely gluten free! Chia seed replaces the egg as the binder and soy milk replaces the dairy, making these completely vegan, as well. Does anything pair better with black beans than sweet potato? Didn't think so. These delicious flavors form the base of your burrito. Feel free to dress them up with whatever you can imagine! I used red onion, fresh tomatoes, and salsa. You could also use avocado, guacamole, scallions, peppers, etc. 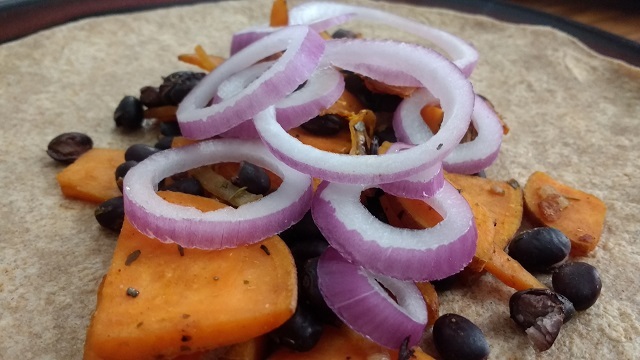 All you need to do to make your burrito is to saute the onion in your oil, then brown up your potatoes, and finally stir in the black beans and seasonings. Then, you can spoon it onto your wrap, top it with whatever toppings you enjoy, and eat! 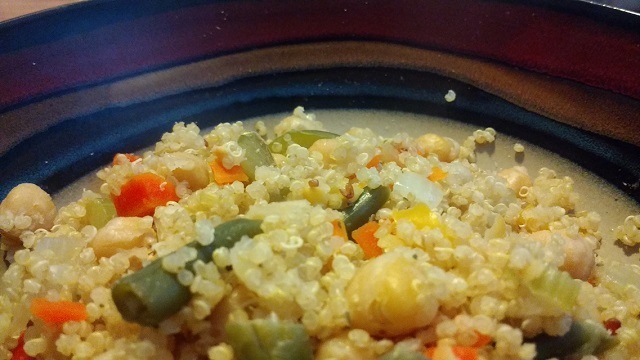 This was a really quick and easy weeknight dinner. I hope you enjoy! 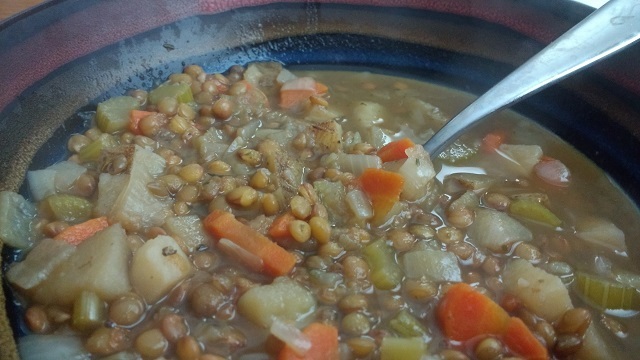 Lentil-Potato SoupYum The other night I was in need of a seriously satisfying hearty dinner. Also, I didn't have the time to soak and cook beans from scratch. Lentils provide really deep flavor in addition to cooking up pretty quickly. This is a super simple recipe. All you need to do is saute the onions in the olive oil quickly, then add the remaining ingredients and let simmer on low. It's the perfect meal to cook up when you can't pay close attention to what you're cooking. Roasted Pumpkin SeedsYum Between jack o lanterns, soups, and pies there are a lot of reasons to cut into those giant (and not-so giant) orange squashes. One of my favorite reasons to disassemble a pumpkin are the seeds. 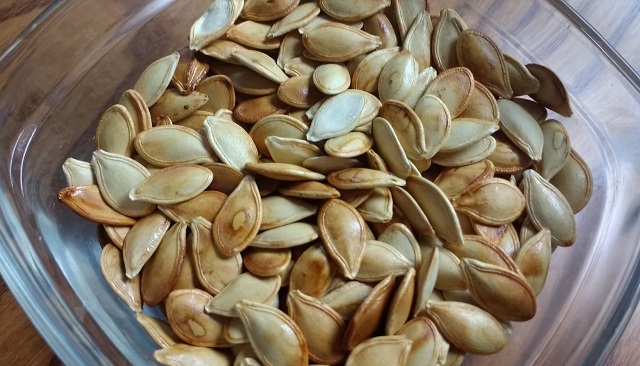 Pumpkin seeds are not only delicious, they are also a great source of protein and fiber. And the best reason? My toddler is totally pumpkin seed addicted. You don't have to limit yourself to pumpkin seeds either. Butternut squash and acorn squash seeds are equally delicious (although the yield per fruit is less). The way that I always made them with my mom was to soak them in saltwater in a jar overnight, and then bake them in the oven with a little oil in the morning. Allow them to cool and then transfer them to a bowl where they can be stolen by tiny hands while you are trying to take a photo. Seriously.